Dream Bingo UK in no longer approved by bingogals. Please check our UK Bingo Reviews for all the best UK bingo sites. This UK bingo site has 90 ball bingo and 75 ball online bingo games that are fun to play packed with vibrant colorful bingo rooms. You can take part in several options of online bingo games with the Progressive Jackpost (PJP) where can win in excess of £1,500 in regular and special promotion games. Join from bingogals to grab this great first deposit bonus. Triple your first deposit with a massive 300% bonus. There are two more big bonuses coming up next as you will receive 100% on your 2nd deposit and than 200% on your 3rd deposit. DreamBingo offers a regular deposit bonus of up to 25%. DreamBingo.co.uk has a huge selection of jackpots and progressive jackpots. You just need to check their promotion page to what games are currently running. They offer bingo games in 75 balls and 90 balls. If you need to get in touch you can do so by e-mail, toll free telephone and help desk support. This site has many deposit including; Debit Cards, Credit Cards, Click 2 Pay, Neteller, Ezipay, EcoCard, Money Bookers, Ukash, Direct Bank Transfer, Click and Buy, Entropay, Use My Bank, Pay Safe Card and Wire Transfer. As for payout options you can choose from; Debit Cards, Cheque, Visa Withdrawal, Click 2 Pay, Neteller, Ezipay, Entropay, Eco Card, Money Bookers, Direct Bank Transfer and Reversal Of A Request. This UK bingo site is run on Microgaming Software. Microgaming offers speed, better graphics and greater scalability, flexibility and security. When you are ready start than you can get a 300% Welcome Bonus. When you play with here every day is Bingo day! Get playing and you could be the next Dream Bingo UK Bingo Winner. Live the Dream! 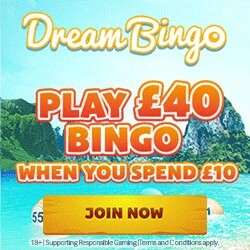 For a more in-depth review please read the Dream Bingo UK Review at Bingoguy.com.